Hello, today I’m doing a Fossil FS4656 review. 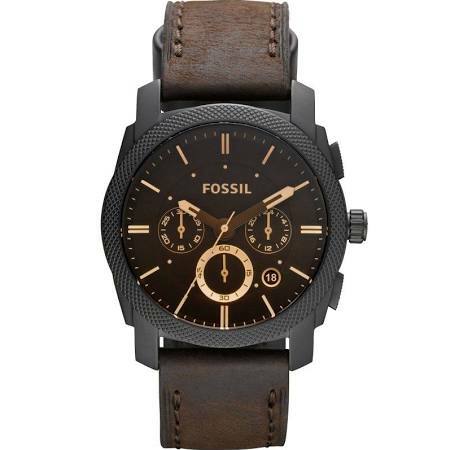 This men’s Fossil Machine watch featured a black ion-plated casing with a rounded face and dark brown dial. The watch has a chronograph function and a date display. 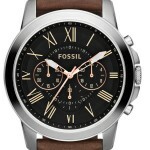 It’s a very popular timepiece for Fossil, so hopefully you’ll like it. I hope you enjoy this Fossil FS4656 review below. This Fossil watch features a brilliant dark brown dial with golden toned detailings for the hands and hour markers. There’s 3 chronograph sub dials on display as well as a small date function located between the 4 and 5 o’clock hour markers. One of my favourite aspects of this watch is the knurled effect on the bezel of the watch. The casing itself is made of a black ion plated stainless steel with the crown located at the 3 o’clock position. 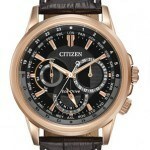 There are two pushers either side of the crown which are used to operate the chronograph function of the watch. The front of the watch is protected by a specially hardened mineral crystal glass. This is a common type of glass that’s found on many watches in this price range. It offers a good level of scratch and knock resistance. At the heart of the watch is a reliable battery powered Japanese quartz movement. These movements are found in many watches as they’re affordable and long lasting, requring very little maintenance. The casing diameter of this Fossil watch is a decent larger size at 45mm. Bigger watches have become pretty popular, but unfortunately they aren’t always suitable for people with smaller wrists. The thickness of the casing is approximately 13mm which is a standard sizing for a men’s watch. The strap is made of a vintage style genuine leather strap with a very natural look to it which I quite like. It’s 22mm wide which goes perfectly with the casing size in my opinion. The strap fastens with a standard buckle style clasp. This watch has a decent 50m water resistance rating. A 50m or 5 bar rating makes this watch suitable for swimming, white water rafting, non-snorkeling water related work, and fishing. 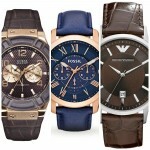 Fossil are one of the most popular affordable watch brands with a huge selection of styles available. This is one of their best selling watches at the moment and it’s easy to see why, it combines popular design and functionality with an affordable price tag. Hope you enjoyed this Fossil FS4656 review. Find more watch reviews below.